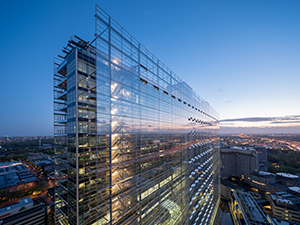 The new premises of the European Patent Office (EPO) in The Hague have been named "Best Tall Office Building" by the Council on Tall Buildings and Urban Habitat (CTBUH), an internationally recognised arbiter on tall buildings. 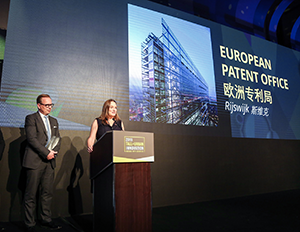 Edda Franz, EPO Principal Director General Administration, and Diederik Dam, Dam & Partners Architecten, accepted the award at a conference in Shenzhen, China, on Wednesday, 10 April 2019. The CTBUH had already ranked the EPO's new building among winning projects in the category "Best Tall Building 100-199 Meters" last year, qualifying it to compete for further distinctions at the Shenzhen event, which drew international entrants in multiple categories. To be considered for an award, construction projects need to make significant contributions to the advancement of tall buildings and the urban environment, with sustainability as a key focus area. Each project is expected to minimize effects on the natural environment, have a positive influence on inhabitants in the local area, and be of economic vitality to its occupants and the community. EPO President António Campinos underlined the significance of the building. "We are delighted to receive this recognition and I extend my sincerest gratitude to architects Jean Nouvel and Diederik Dam who turned our shared vision into a reality. Our office in Rijswijk is now not only a state-of-the-art workplace for staff, but also an internationally recognised symbol of the EPO's commitment to innovation." Speaking on behalf of Ateliers Jean Nouvel and Dam & Partners Architecten who created the building, Diederik Dam added "For us, our Dutch-French architectural cooperation began with friendship. And it continued in that spirit of mutual respect and the sheer joy of designing together. The design of the new premises for the EPO was forged from a truly international cooperation. And it is fitting that the equally international community of the EPO's staff in The Hague now have a new home". Construction began in 2014 and four years later, the building was inaugurated in the presence of His Majesty King Willem-Alexander of the Netherlands. Staff moved into their offices in September and October of 2018, bringing together examiners, lawyers and support teams on one site and in doing so, fostering greater synergies among EPO departments. The slim tower measures 107 metres in height, 156 metres in length, yet is only 24.7 metres in width. It also has several distinct features: The double glass facade houses hanging gardens containing 300 different varieties of plants and the cavity between these facades channels fresh air into the smart ventilation and climate system. The original design brief stated that the building should be 20% more energy-efficient than limits set by the Netherlands as part of its commitment to meeting EU legislation. To this end, photovoltaic solar panels on the roof provide a source of renewable energy and an aquifer thermal energy storage system reduces primary energy consumption and related CO2 emissions. The Hague construction project was entirely self-financed and is the Office's largest single investment in its history in the Netherlands. Some 2 000 staff work in the building where advanced technical infrastructure helps patent examiners implement the European patent grant process. Among those to benefit are the inventors and their legal representatives attending oral proceedings related to the examination of their patent applications. 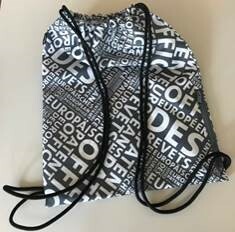 Up to 3 000 such proceedings are held by the EPO every year.